he holiday countdown is on, and that means stress can be high. And since you don’t want to end up on the “naughty list” at the last minute, take in these five tips that can help simplify the season so you can focus on enjoying celebrations and making memories. With a holiday to-do list as long as Santa’s, finding time to clean will end up on your wish list. Take the pressure off and begin with the simple things. Remember, a tidy home looks cleaner than a cluttered home. So grab a laundry basket and pick up all the stuff that belongs elsewhere. You’ll have instant satisfaction without having gone overboard. 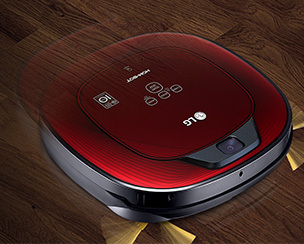 Delegate floor chores to the super smart LG Hom-Bot. There’s no need to show this automated vacuum where the dust bunnies are hiding, because with innovative and intelligent features like the Dual-Eye 2.0™ Mapping System it learns your home’s layout, so it doesn’t miss a spot. And the Auto Resume feature allows it to continue cleaning where it left off. Hom-Bot efficiently sweeps and dry mops, and is thoughtfully designed with seven custom cleaning modes. This could be your best holiday helper yet! Less can be more! Put out only your favorite holiday decorations and ditch or donate the stuff you no longer love. A few well-chosen decorations placed in strategic places can make your home merry in mere minutes. Bring the outdoors in. 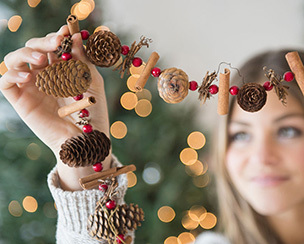 Readily available natural items such as pinecones, holly and cranberries add an authentic touch. The best part is they don’t pose a storage situation when it’s time to pack things away. Do your holiday cards tend to end up in a pile? Try filling a tall vase with graceful branches and use it to display your cards by hanging them like ornaments. When it’s time to wrap things up (the holidays, that is), be sure to take the time to put decorations away properly. Reusable egg cartons can save your precious ornaments from breaking. Holiday lights will stay tangle-free when you wind each strand around a piece of cardboard that’s cut to fit inside a plastic bin. Just a little pre-planning will make for easier storage and easier decorating for the next holiday season. As the holiday season fills your calendar with festivities, here are some easy ways to avoid wardrobe woes. You can still look stylish while staying comfortable. Simply glam up a casual look with a bold lip and an elegant up-do. ‘Tis the season to sparkle, but go easy on the shine. A sequined skirt, a jeweled necklace or embellished shoe is all you need to look the part this season. Juggling back-to-back parties, with no time to visit the dry cleaner? 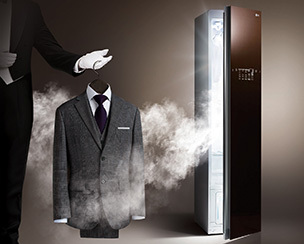 Keep your outfits looking their best with the LG Styler Steamer Clothing Care System. It uses the gentle power of steam to remove odors and wrinkles, so you can refresh your clothes in minutes—even that ugly holiday sweater. Freshen up the air inside naturally. 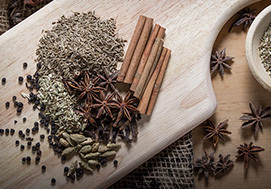 Use a homemade potpourri to create a festive aroma in your home. Simmer a pot of fresh fruit, fresh herbs, and dried spices on your stovetop. Play around with ingredients to find your perfect scent of the season. Come up with two or three gift ideas that can cover everyone on your list. Maybe it’s a pair of cozy cashmere socks, or a book you loved. Buying these items in bulk may save money on cost and shipping. 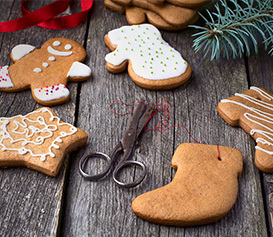 The gift of homemade baked goods is a real crowd pleaser, and a wonderful way to share your favorite recipe. But you can spread the joy—and save some calories for the New Year—by mixing the recipe’s dry ingredients into nice jars and tying the recipes to them with bows. It’s a non-baked good baked good, ta-da! Do you have a go-to holiday time-saving strategy? We’d love to hear it. Share it in the comments below.